X-Plus 25cm MechaGodzilla 1975 | Fresh Vinyl HQ! 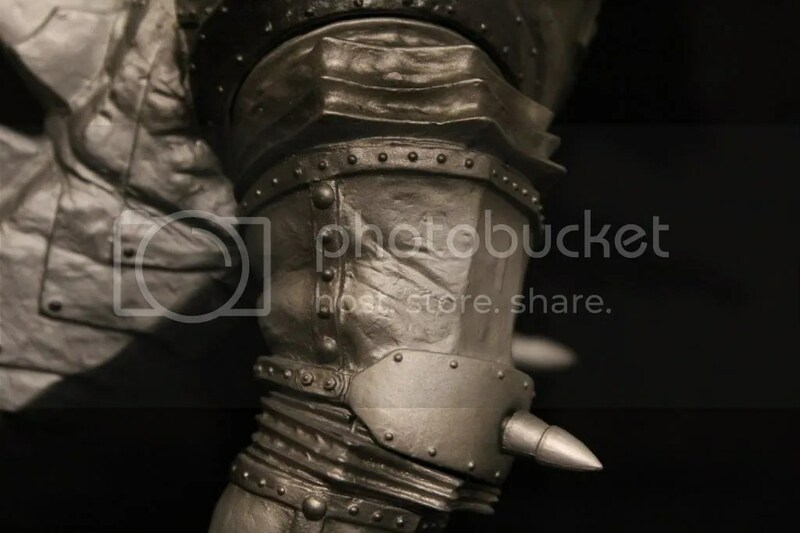 X-Plus released the 25cm MechaGodzilla in April 2013. Standing at about 10 inches tall, this figure fits perfectly in scale within the 25cm ranks. 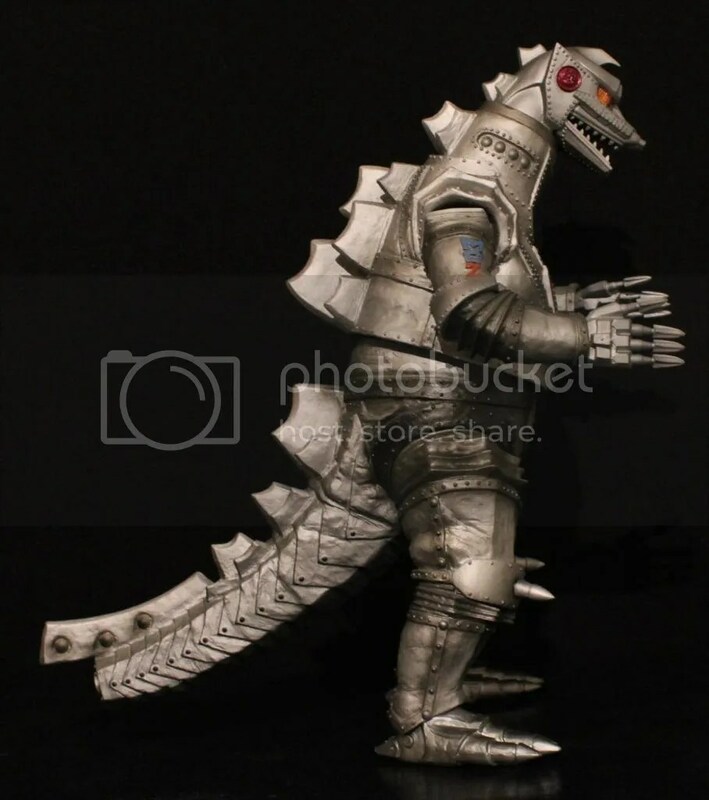 MechaGodzilla was already previously released in the 25cm line in the 1974 incarnation. 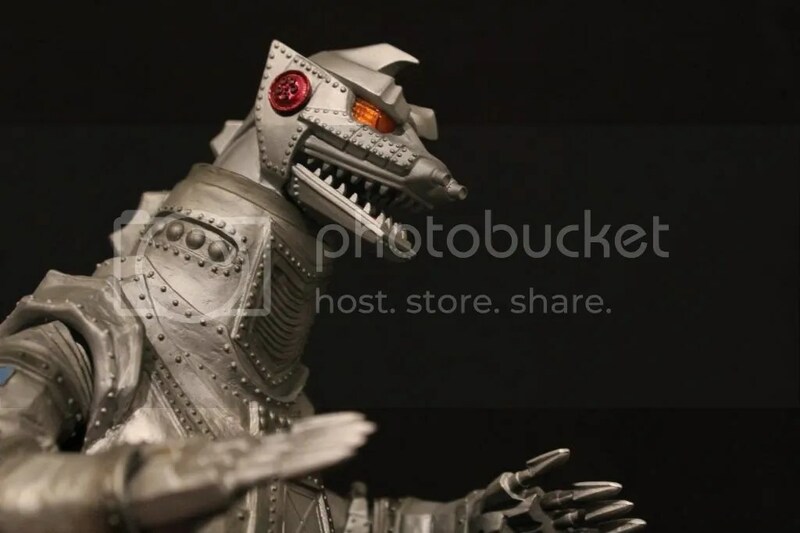 Having a keen eye, you will be able to tell there are many differences to the ’74 and ’75 MechaGodzilla suits. Needless to say, X-Plus captured every little detail from the 1975 suit that was changed from the 1974 suit. 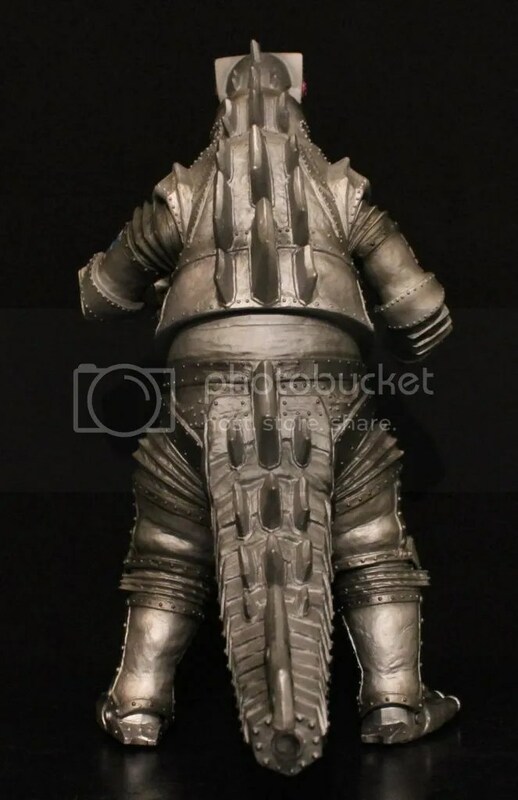 For one, the 1975 suit it a bit more menacing from the evil face, posture and right down to every little bolt and rivet. All these features are faithfully captured on the 25cm X-Plus MG75. As with every X-Plus figure, detail is top notch! The sculpt and detail are amazing. The detail from the top of the head right down to the tip of the tail is all captured from the suit. 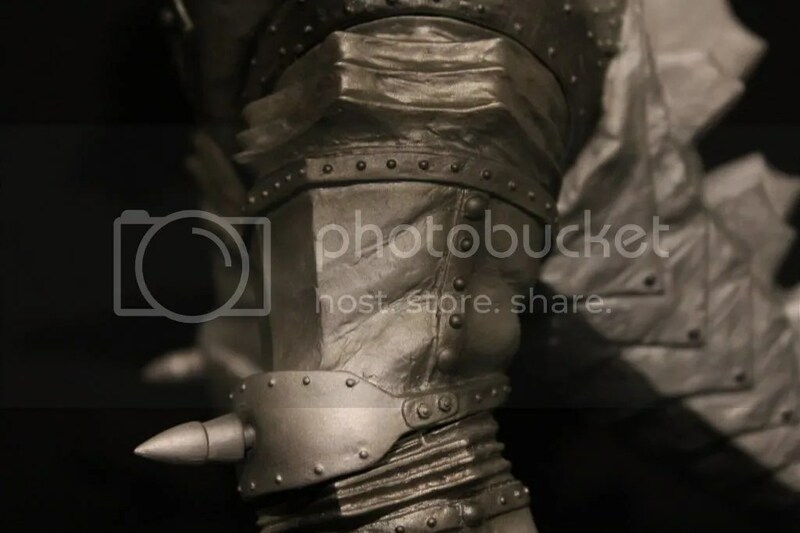 All the rivets and jagged edges are beautifully sculpted. 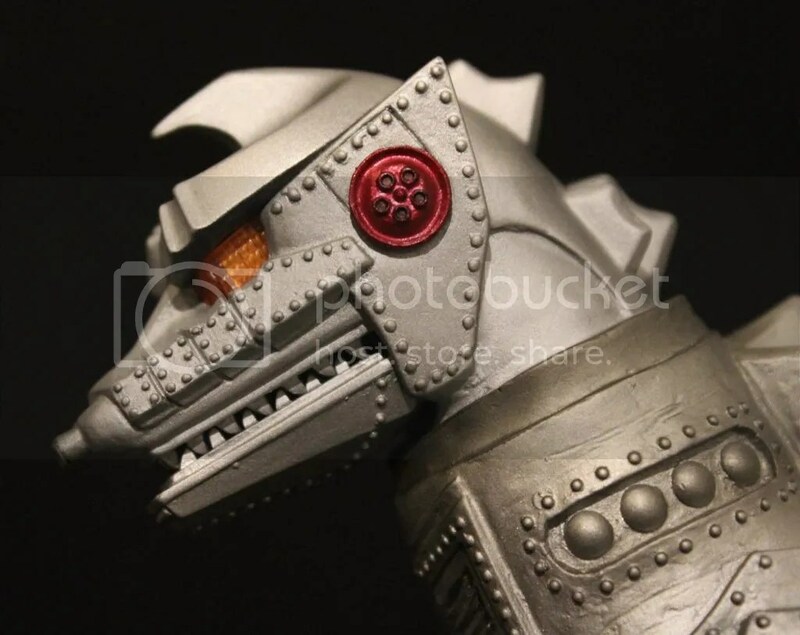 MechaGodzilla is quite sharp looking which gives it that evil look and nothing was missed on this figure. 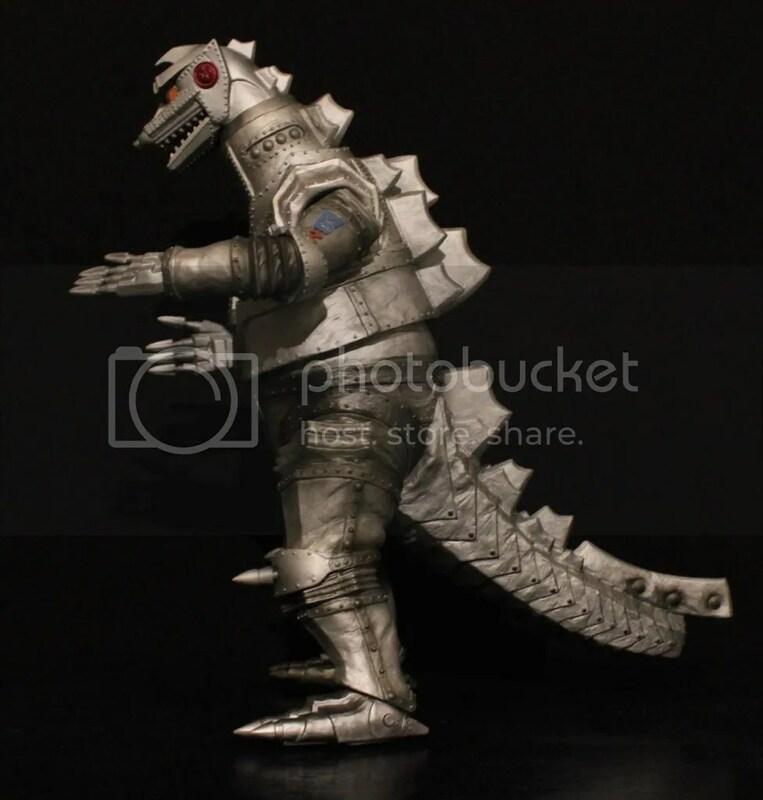 MechaGodzilla’s stance is upright with a slight lean forward as if MechaGodzilla was in step. The pose reminds me of the scene from Terror of MechaGodzilla where MechaGodzilla and Titanosurus are marching down Tokyo next to each other. 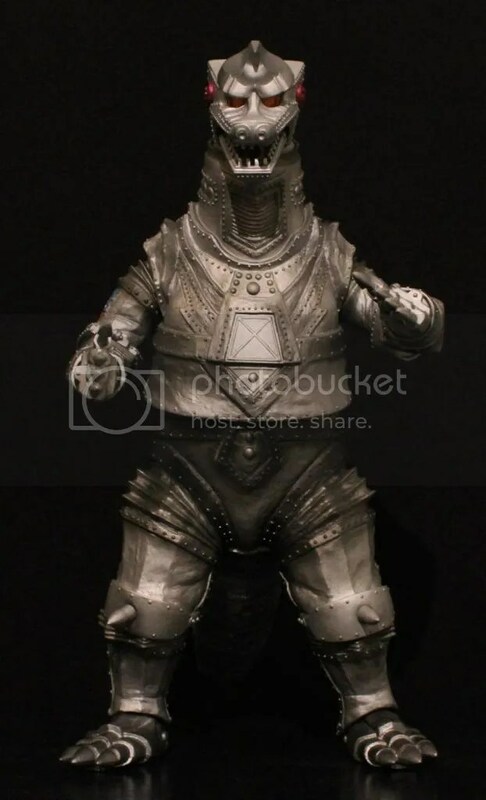 MechaGodzilla 75 was very menacing and the 25cm version of it is equally menacing. So much detail is packed into this release. X-Plus did a fabulous job on this. The paint job is perfect! I love the metallic paint job that covers the figure. There are highlights and shadows sprayed about the figure which gives the figure some additional depth. It looks amazing. The details are amazing. 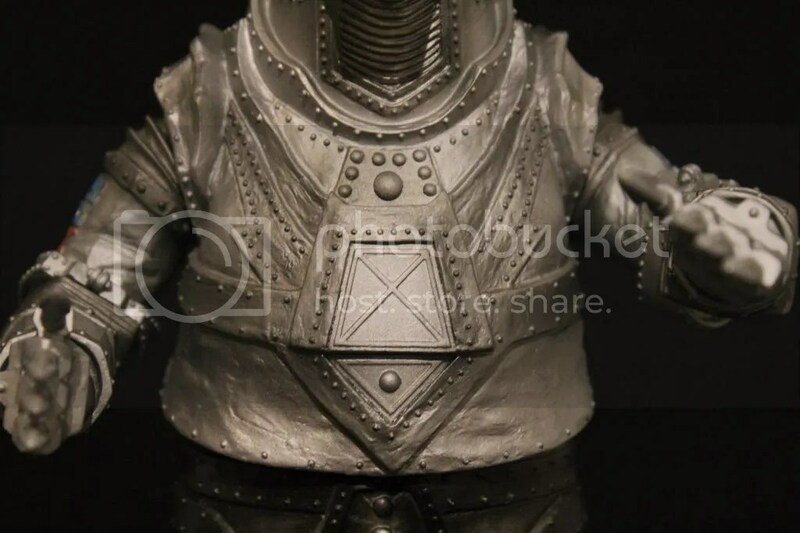 The chest and stomach area carry tons of details. 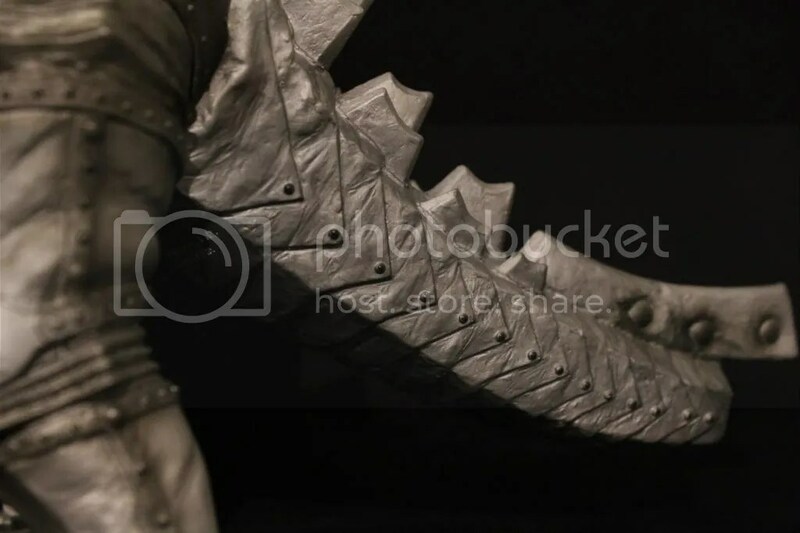 If you have a 25cm MechaGodzilla 1974, the differences in the sculpt are very obvious when compared. 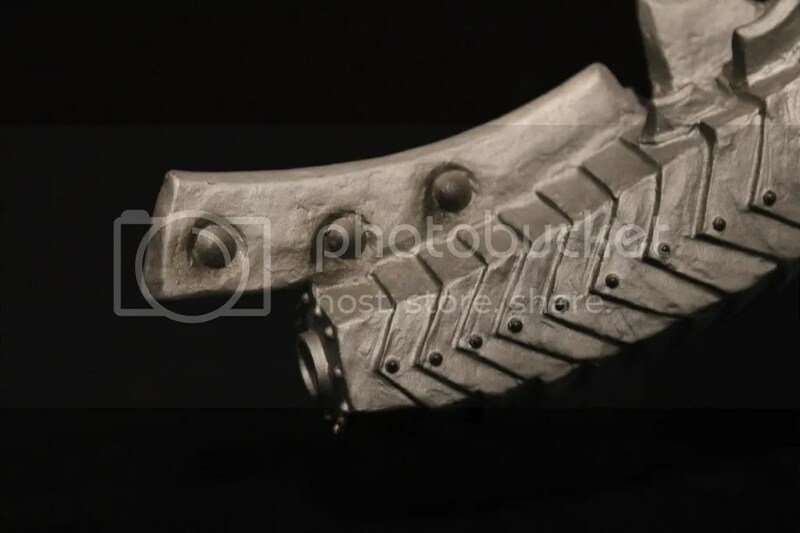 The metal is formed almost lightning bolt shaped as it stretches from the shoulders down to the center of the stomach meeting up with the diamond shaped laser beam door panel. Please take note, the panel door for the laser beam does not open on this figure like the 1974 version. 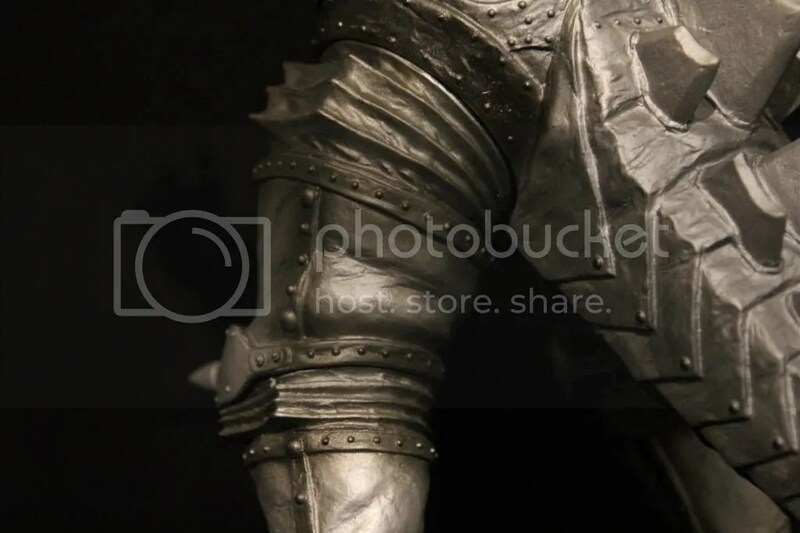 There are so many rivets throughout this figure, it is impossible to miss the detail on any one of them. The legs are equally menacing. The thighs and knees carry that accordion style shock system which looks awesome. The knee caps sport the missile style point on both legs. The legs do carry some articulation at the thighs, calves and at the feet. This minimal articulation is very helpful when posing MG to stand up right. 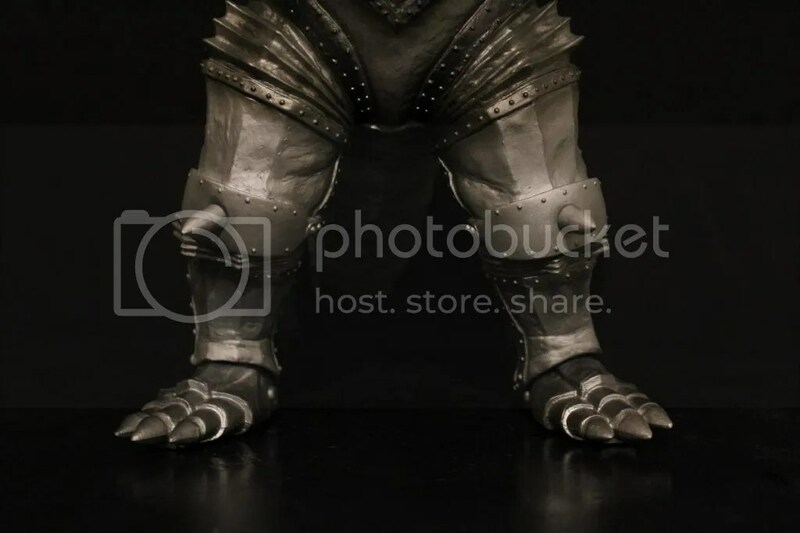 You may need to adjust the legs a bit to insure MechaGodzilla is standing properly so it does not fall forward. 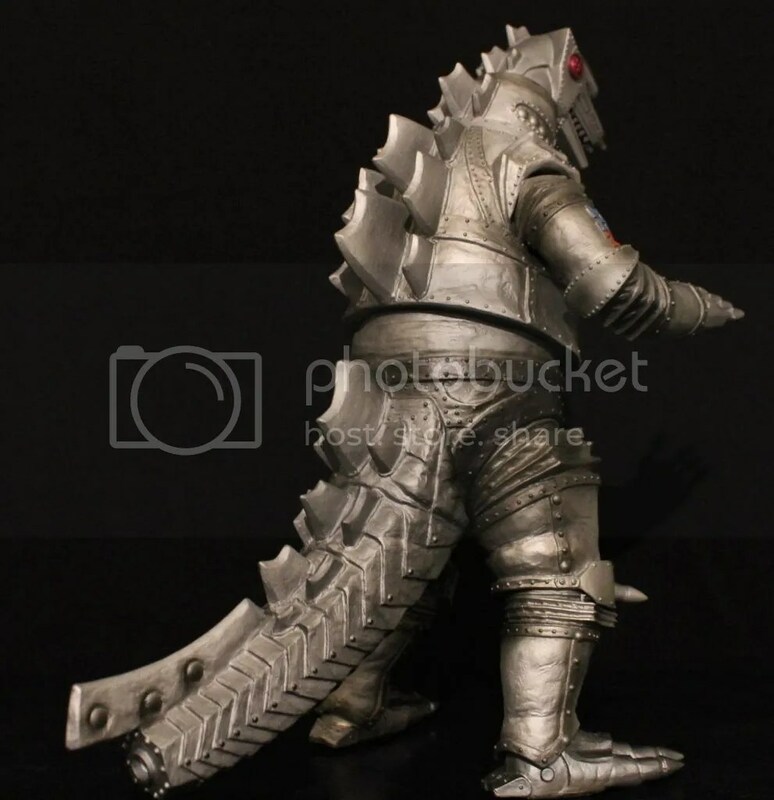 One difference about this MechaGodzilla figure compared to the ’74 release is it does not rest on its tail. The tail on MG75 here is elevated, which means you will have to make sure you have it balanced on the shelf properly. The dorsal plates are faithfully replicated well. Sculpted almost like razor blades, painted metallic with very little highlights, the dorsal plates look great. Starting at the top of the head and running down the back right to the tip of the tail. Very evil looking. Another area of detail that I absolutely love on this figure is the wrinkles seen from the suit. X-Plus did not short change any detail here at all. The wrinkles are from the rubbery like suit and could be seen clearly in the leg and thigh section. This just goes to show how close X-Plus wanted to make these figures look just like the suit. Great job! Even the tail shows wrinkles from the tail being dragged to one side by Godzilla. 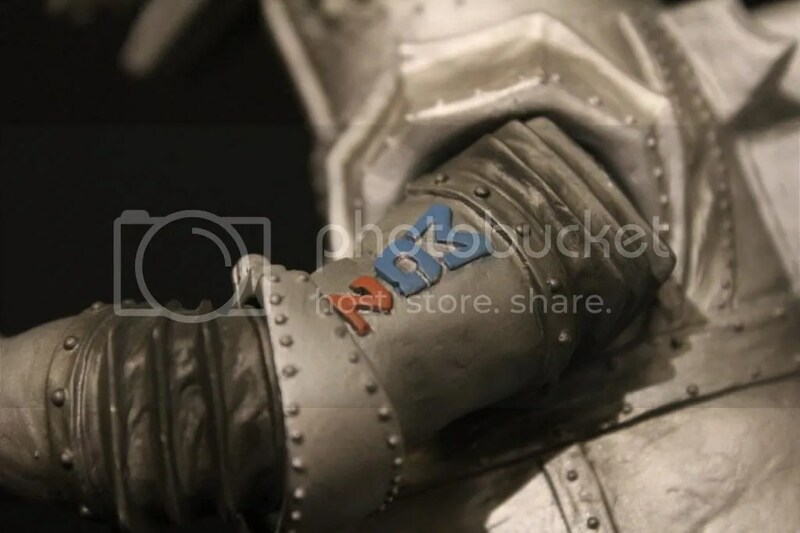 These wrinkles are also attributed to wear and tear on the suit throughout the production of the film. Yet another fine detail replicated directly from suit is the “MG2” insignia from the forearms. On both arms, “MG2” is painted in blue letter with a red number 2. Fresh looking! 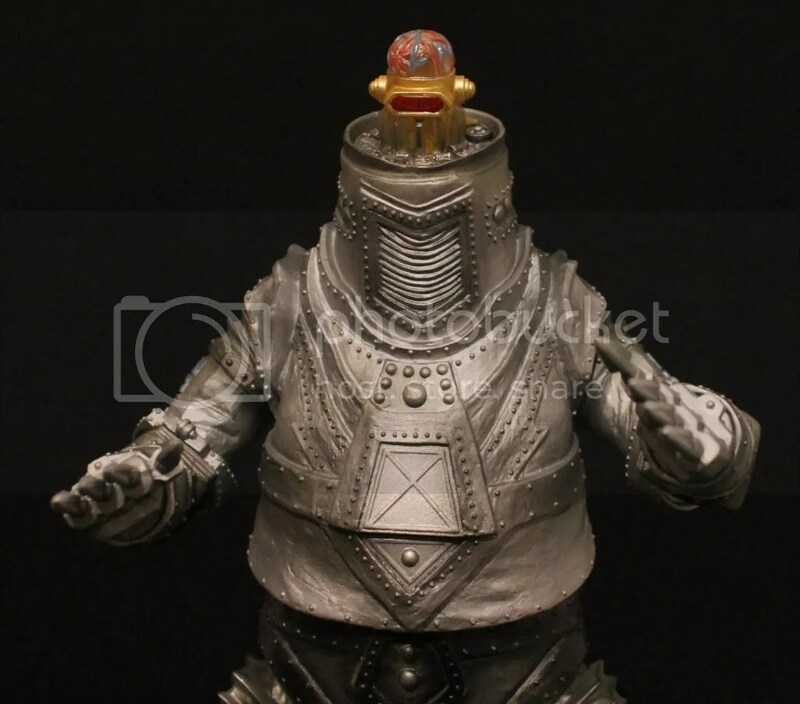 The RIC Boy feature for MechaGodzilla 1975 is really awesome and one of my favorite RIC Boy features of all the X-Plus figures. The RIC Boy feature for MG75 comes with a interchangeable head and brain! After Godzilla pulled MechaGodzilla’s head off in Terror of MechaGodzilla, the brain was exposed and that is replicated very epically here. 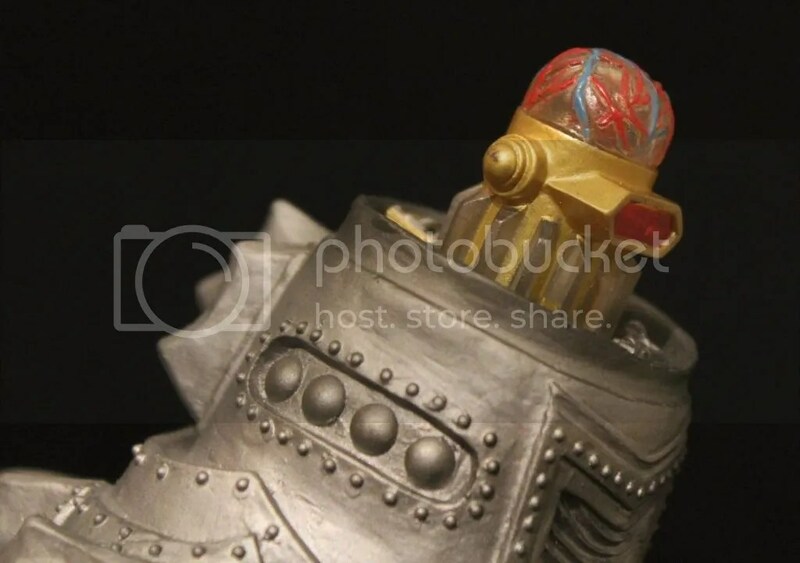 I prefer to have my MechaGodzilla ’75 figure displayed with the RIC Boy brain on. It is just so menacing looking and something that is not well represented within many of the toy lines in our hobby! BAM! 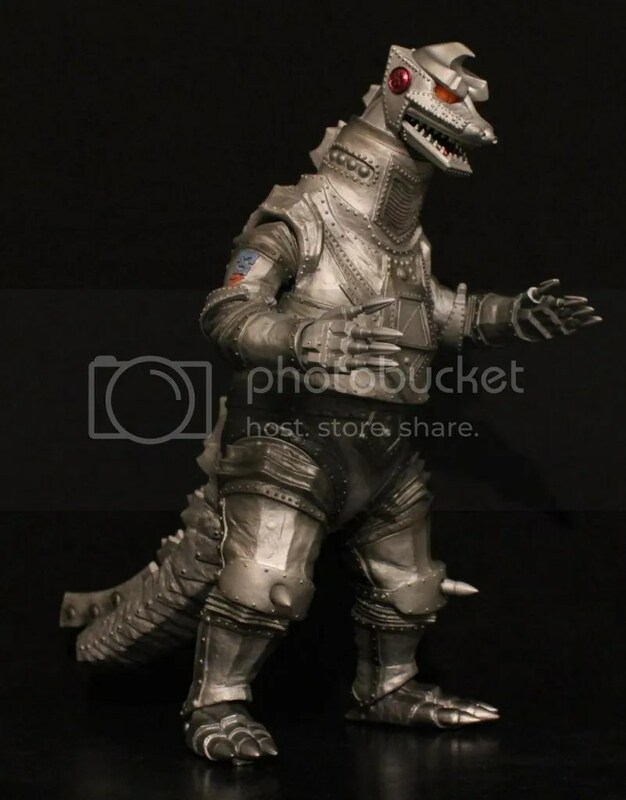 This 25cm MechaGodzilla 1975 figure is hot! The RIC Boy release is in high demand, so if you can find it for a reasonable price, jump on it. When this figure was released in April 2013, the cost was about $95. The RIC Boy release cost about $125. To find this figure at release price will be nearly impossible. Regardless of the price hike, this is a great figure. On my own account, out of the three 25cm MechaGodzilla figures, this is easily the best of the bunch!